Last Saturday, Feb. 16, the folks at Cornwall Iron Furnace helped kick off Lebanon County’s bicentennial celebration by staffing a booth at the Lebanon Valley Expo Center. Modeled after the 1913 centennial program, Saturday’s well-attended event featured historical info and music, but also included 118 community organizations from around the county. As part of the year-long commemoration of the county’s founding, Cornwall Iron Furnace is organizing a tour of historic Cornwall for Saturday, Oct. 5. [I had the wrong date when this was first posted; Oct. 6 is the raindate for the tour.] To read more about Saturday’s festivities, go here. You can also catch a glimpse of the Cornwall gang near the beginning of this clip from WGAL’s tv coverage. There’s a lot to look forward to at Washington Crossing Historic Park and lots of people ready to do some looking. A ceremony is planned for Charter Day, March 10, as the newly renovated Visitor Center opens to the public and the rest of the site emerges from its winter schedule. 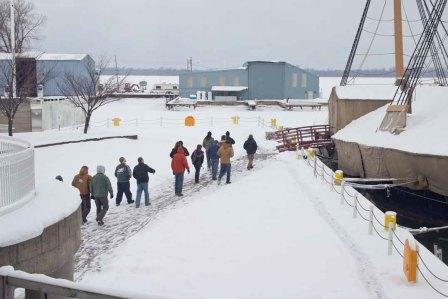 (Work is also gearing up for the orientation exhibit that will be installed in the new building, exploring the 1776 Christmas night crossing and the events surrounding it.) Looking further out, PHMC has engaged Marianna Thomas Architects of Philadelphia to develop a master plan for Washington Crossing, evaluating the park’s resources and charting a course for its long-term health and sustainability. Community and other stakeholders will be included in the process, which is expected to take place this spring and early summer. You can read more about the details here. And speaking of Charter Day, don’t forget that the other Trails of History sites (with a couple of exceptions) will be open free of charge on March 10 for our annual tribute to Pennsylvania's birthday. Watch for more info on that in next week’s post. Until then, have a great weekend and enjoy the final bits of February. First, a couple of quick programming notes. Landis Valley Village and Farm Museum and Washington Crossing Historic Park have events going on this weekend. Fort Pitt Museum and the Railroad Museum of Pennsylvania will be open on Monday for Presidents Day. Many thanks to Linda Bolla and Jennifer Rogers of the Erie Maritime Museum for their contributions to this post. If you’ve ever wanted to sign on for one of Niagara’s live aboard sailing school programs but couldn’t quite swing the tuition, you may be in luck. The Flagship Niagara League has just announced a three-year scholarship program funded by a generous bequest from Captain Arthur M. “Skipper” Kimberly, who passed away in 2011. Each applicant must complete appropriate paperwork and submit an essay on why he or she should receive a scholarship; awards will be made on the quality of the essay (assuming all other requirements are met). For the particulars, go here. 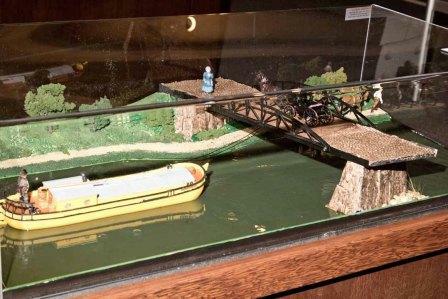 In addition to preparing for the bicentennial, the Museum is focusing attention on slightly more recent history with an exhibit on the Erie-Extension Canal, which opened in 1844. 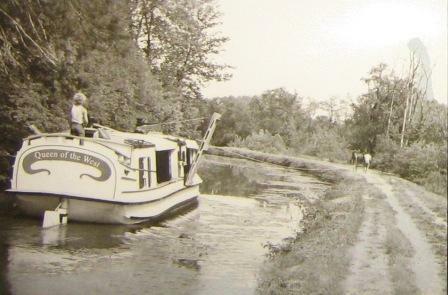 The Erie-Extension, part of Pennsylvania’s canal system but privately owned by the time it was completed, connected Lake Erie with Pittsburgh and commerce to the east and west. The canal basin at Erie helped to bring business to the city and spurred development of its harbor. The exhibit draws heavily from a private collection donated to the museum by attorney Elizabeth Malc-Dwyer, with additional items from the Hazel Kibler Memorial Museum’s collection and Erie Maritime Museum. Malc-Dwyer’s interest in the Erie-Extension Canal was ignited when she discovered that the building in which her law office was located was on the bed of the old canal, at the site of the Sixth Street bridge. The exhibit, “The Erie-Extension Canal: Gateway to the Great Lakes,” will be on view through June and is included in regular Museum admission. Groundhog: Rodent or Savant? Discuss. Bet you thought I was through talking about the weather. But as I write this on Thursday afternoon, I have heard a bunch of different stories about what to expect (and I saw a headline that said NYC would either get 3 inches or 30). I guess that’s par for the course since Punxsutawney Phil says “early spring,” but Octorara Orphie says “6 more weeks of winter.” Can they both be right? Anyway, this might be a good time to cull through the pile on my desk for items that got missed in last week’s February program preview or that otherwise just need to be passed along. I was all set to let you know about a book signing later this month at the Anthracite Heritage Museum featuring The Civil War in Pennsylvania: A Photographic History. The book, published by the Senator John Heinz History Center as part of the PA Civil War 150 initiative, includes a wide array of photos, many of which have not appeared in print until now. (By the way, PHMC’s annual theme for 2013 is the Civil War and the centennial of the Pennsylvania Historical Commission.) Unfortunately, the event has had to be postponed due to a scheduling conflict. We’ll keep you posted when there’s a new date. In the meantime, you can purchase a copy of the book at SHOPpaheritage.com. A previous post mentioned that facets of Washington Crossing Historic Park were nominated in several categories of Bucks County’s the “Happening List.” Well, as it "happens" Graeme Park and Hope Lodge are both nominated for “Most Happening Historic Spot” in the Montgomery County contest. (Also note that Graeme Park’s “A Colonial Valentine” program is this Sunday.) And I missed the fact (sorry) that Pennsbury Manor and the Thompson Neely House (at WCHP) are both on the list of nominees for Most Happening Historic Spot in Bucks County. You can vote more than once, so how about showing all of our Trails of History nominees some love? The Pennsylvania Military Museum has a new website (same address) that you can check out here. The navigation is a little different from the old site, but they still have lots of great photos of their programs. Enjoy! So long until next week. Good stuff going on this month on the Trails of History. Winter schedules are in effect at many sites so, as always, please be sure to check before you head out. Fort Pitt Museum and Railroad Museum of Pennsylvania will be open on Feb. 18 for Presidents Day. Feb. 3: Fireside Tales in the Wayside Lodge—children ages 4-8 and their families are invited to enjoy an afternoon of storytelling and learn about colonial life in the Oley Valley. Dress for the weather and bring an extra blanket if it’s really chilly. Hot chocolate and cookies will be served. $2 donation is suggested. 2 pm. Feb. 10: Black History Lecture—Dr. Teresa Gilliams will explore the topic, “What’s Necessary about Black History Month: Is America Really Post-racial?” Dr. Gilliams, associate professor of English at Albright College, was a 2011-12 Fulbright Fellow and earned her doctorate in African American Literature at Howard University. $2 donation suggested (regular admission fee charged for touring the historic buildings). 2 pm. Feb. 7, 14, 21, 28: Winter History Class—each Thursday participants in the Winter History Class learn about the history of the celibate brothers and sisters, the world they lived in, and the work of preserving the collections and buildings. The class began in January, so contact the site at 717/733-6600 to see if space is still available. Feb. 10: Colonial Valentine—special tours will explore the life and loves of Elizabeth Graeme Fergusson (a bittersweet story to say the least). $12 per person includes tour and refreshments. Tours will start every half hour or so. Go here for more info. Noon-3 pm. Feb. 2: Moravian Paper Stars—part of the folk art workshop series at the Weathervane Museum Store. Go here for details. 1 pm. Feb. 6, 13, 20, 27: Winter Homeschool Classes—a variety of hands-on workshops offered each Wednesday (continues in March as well). Go here for a list of classes and other details. 9 am-noon. Feb. 15-17: Winter Institute—hands-on classes (ranging from half-day to three days) and lectures make up this popular program. Classes with insufficient registration as of Feb. 5 may be cancelled, so if you’re interested, don’t wait to say so. Go here for all the info. Feb. 23: Beginning Quilting—offered at the Weathervane, this class will teach basic skills as you make a 4x9 patch square. AND Heirloom Seed Program workshop—offered in cooperation with Backyard Fruit Growers, there will be a variety of sessions. For info and registration (required) for either of these, go here. Feb. 6: Behind the Scenes Tours—a chance to see what you don’t see on exhibit or regular tours—collections storage. There will also be a wine and cheese reception. Reservations are required; cost is $25 ($20 for Friends of OEV). Go here for more info. 6-8 pm. Feb. 6: Richard Koontz Memorial Lecture Series - speaker is Amy Greenberg, Research Professor of History and Women's Studies at Penn State, on "A Wicked War: Polk, Clay, Lincoln and the 1846 U.S. Invasion of Mexico." Presented by the Friends of the PMM. Donation requested. 7:30 pm. Feb. 7: Maple Sugaring School—ever wanted to learn the processes that turn tree sap into sugary goodness for your pancakes? This is your chance. This program will kick things off with an overview of sugaring (including its significant history in Somerset County); additional work sessions will be held throughout the season, according to nature’s schedule. This article provides details on registration. Fee charged. 6:30-8:30 pm. Feb. 3: Emancipation Proclamation exhibit closes—the copy on display is on loan from the Union League of Philadelphia and will have to return home. If you’re interested in learning more about the proclamation, you can watch historian Harold Holzer’s recent lecture (at State Museum, sponsored by PA Heritage Foundation) here. Feb. 15: Curiosity Connection StoryTime kicks off at 10 am and continues on Friday mornings through March 8. Susquehanna Art Museum’s DOSHI Gallery at the State Museum opens “Course and Discourse,” an exhibit pairing work by students and their professors. Another edition of Artists Conversations, featuring artist Kevyn Bashore and Susquehanna Art Museum exhibits curator Amy Hammond, will be this month’s 3rd in the Burg event. For more info on any of these, go here. Feb. 17: Washington’s Birthday—come celebrate GW’s 281st birthday and enjoy blacksmithing demos, open hearth cooking, and more (including birthday cake and cupcakes). 10-2 pm (singing of the birthday song is scheduled for 1:30).